Place the flour, salt and pepper in a small bowl and mix to combine. Heat the oil in a large, heavy-based saucepan over high heat. Dust the lamb shanks in the flour and cook for 3–4 minutes or until well browned. Remove from the pan and set aside. Add the onion, garlic, tomatoes, stock, wine, rosemary and sugar to the pan and bring to the boil. Return the lamb shanks to the pan, cover with a tight-fitting lid, reduce heat to medium and cook for 1½ hours or until lamb is tender. Preheat oven to 200ºC (400ºF). To make the pastry, place the butter, salt and water in a medium saucepan over high heat and bring to the boil. Remove from the heat and stir in the flour until a smooth dough forms. Turn out onto a lightly floured surface and knead until smooth and elastic. Roll the pastry out to 2mm-thick and cut out 4 x 21cm rounds. Cooked this today. Couldn’t find the right tins to bake it in so removed the flesh from the lamb shank bones and made a ragu. Then baked pot pies in ramekins. Wow. Very yum. However, after baking the shanks in the oven and removing them from the liquids, we reduced it over high heat for about 30 minutes and then had to add some corn flour to thicken it up to a consistency we felt was appropriate for a pie. Worked well. 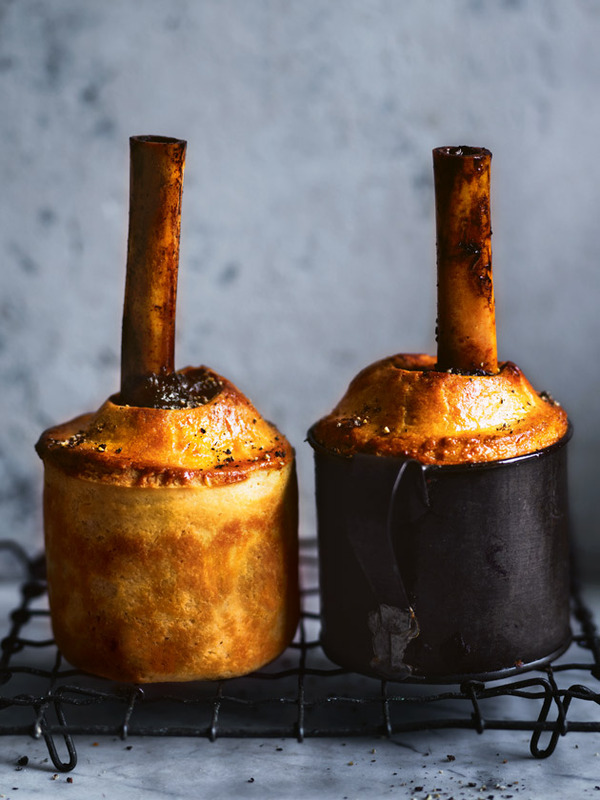 The pot pies probably needed 40-50 min in the oven to cook the pastry properly.